Be you a visiting supporter or a newer London Irish one, we very much want you to enjoy our famous match day experience. To help you do so, we set out here some of the key aspects of any visit to a London Irish game at the Madejski Stadium (Madstad). The Madstad is a modern, well designed, stadium with a 24,400 capacity. It was designed by the same team as that of Cardiff's Millenium stadium and is arguably one of, if not the, the best in its class anywhere in Europe. All the seats are comfortable and afford good views of the pitch. Given the size (We initially thought it was way too big but have grown into it) and location (Edge of town retail/industrial area) of the Madstad it was a challenge to make the place welcoming. We take great pride in saying that we have. Our enforced move here in 2001 ago to what a some still call "A soulless football stadium" was never going to change the fact that where we go, so does the party. Things at the Madstad are by no means perfect but we have made great strides down the years. The match day experience, approached with the right knowledge and attitude, is usually a great day out. Craic (Pronounced 'crack') is an Irish word for which there is no easy translation in English. It means having a good time, enjoying the company of others, friendship, fun and a lot more besides. Hospitality to visitors and enjoyment of 'More than 80 minutes of rugby' has long been fundamental to the ethos of the club and its supporters. For those of you reading this who have not yet experienced a visit to London Irish I cannot stress enough the importance of this aspect of our being. Indeed it is for this very reason that many visiting supporters still regard LI as their second favourite club. We are very proud of this reputation and guard it jealously. Be it by road or public transport the Madstad is easily accessible. At the bottom of this article is a map detailing some of the key locations mentioned here. By car: The Madstad is just to the north of Junction 11 of the M4 on the A33. It is signposted (and can be seen if approaching from the West) from the motorway. Parking inside the stadium complex costs £8. Be warned though that if the match is expected to have a high attendance, such as for our Saint Patrick's weekend or Christmas games and the car park starts to fill up, you won't be allowed in with out a pre-booked parking ticket. For big matches the queues on the motorway and other approach roads can be inordinate. So much so that at least once in recent times kick off had to be delayed. One alternative is the HP car park, across the road from the Stadium. This also costs £8 and is preferred by some as, after the game, it enables a quicker escape to the M4 than the stadium car parks. There are cheaper unofficial car parks in the industrial estate near the stadium. If you don't mind a walk, you can park without charge at Three Mile Cross. This is the other side of the motorway and home of one of our favourite pubs, The Swan. (See below) This is approximately a 30 minute walk from the stadium. Wherever you do park, we strongly advise you not to attempt to do so in local residential areas, grass verges, etc. Reading Council some time ago introduced parking regulations to prohibit this. These are not always apparent but they do exist. Even on a Sunday you will get ticketed or towed away. Public Transport: Reading railway station is about 3 miles North of the Madstad. It is one of the UK's major railway junctions. There is a regular mainline service to and from London Paddington and all points West. There are also a plethora of other services in many directions. The bus station is adjacent to it. From there on match days there is a regular shuttle bus service to the stadium. It costs £3 adult return (£1.70 single), £1.50 child return (£1 single) or £4.50 family return (up to 3 adults). On Sundays the last bus officially leaves the stadium at 6.30 p.m, although we have had reports that they run after this. This does not allow much time for post match craic. In addition to the shuttle service, Reading buses run a service between the Engineers Arms and Reading Station. The stops are marked on the map below. At the time of writing I have no idea of the schedule. Taxis to and from town center cost around £12. On match days, the East, West and South stands are open. If the need arises, the North stand will also be. The seats in the East, West and North are reserved, in the South they are unreserved. If in the South stand, regardless of what it says on your ticket you sit where you want, or can. London Irish Supporters congregate in both East and West stands, plus the others if they are open. In the East Stand the Eastiebeastie Drum Corps section can be found just above the disabled area, on the 22m line. The East stand is all reserved seating but if you do want to try to sit beside or near the the drummers, enter through tunnels Y20 and Y21, as it is usually possible to find a seat. If you do come to this area be prepared for a lot of noise. 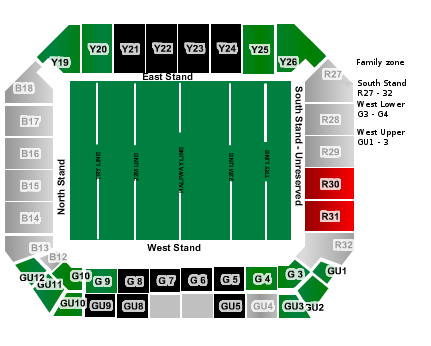 Tickets for away fans are usually allocated in the Southern end of the East Stand between the 22 and the try line, The East Stand houses a lot of London Irish Season Ticket holders, but there are usually seats to be found in reasonable number in all of the stands. You can book online via the Online Booking Service. Reservations can also be made by calling the hotline on 0870 999 1871 (Open Monday to Friday 9am to 9pm, Saturday 8am to midday, Sunday 9am to 8pm) or visiting the ticket office at the stadium itself. On match days there are ticket offices at both the East and West stands. The West stand office is always busier so if you want to go into the East stand we suggest you buy your ticket there. One of the difficulties of sharing stadium facilities is that we have no clubhouse. The closest we come is JC's (officially called the Jazz Café) which is situated in the middle of the East stand. The North Stand Bar, commonly referred to as "The Cowshed" is situated exactly where you'd expect it to be. This is where top rated bands play both before and after games. In the past it was a habit for many of the regulars from this site to hang out at the rear of this bar after games, that appears to be less so now. The Cowshed is also the home of Diggers Pound. An opportunity for younger supporters to meet the LI mascot and players ? For those wishing more comfort and who are prepared to pay the prices (£4.00 for a pint of the black stuff and £5 for a glass of wine last season), there is a bar within the hotel, The Millenium Madejski. Many of the regulars from this site can be found there both before and after games. Inside the stadium there are several bars which sell Guinness, Fosters, Courage Best, wine and soft drinks only and a number of food outlets. Reports are that whilst the service in these has improved somewhat in the last couple of seasons, with the arrival of the new catering company, it is still patchy. Certainly do not expect to be able to leave your seat at half time, buy something, and return in time for the start of the second half. For our Saint Patrick's game pretty well the whole experience is shifted to a 'village' in one of the car parks. Away from the stadium many of us drink at the Swan in Three Mile Cross (See map). As well as being a thoroughly decent and friendly pub it is the home of Jumbo the wolfhound, LI's mascot. From here it takes about half an hour to walk to the stadium. The main LI pubs in the centre of Reading is the Three Guineas. This is run by a London Irish supporter and is conveniently located right next to Reading railway station and the shuttle bus stop. It opens at 10am on match days and is normally packed with London Irish and visiting supporters both before and after a game. .
Brewery Tap: Reading Center, opposite Sweeney & Todds, landlord Eddie is LI fan who played for us in amateur days. Only pub in center that shows our games when on Sky. Hobgoblin: (opposite entrance to Oracle) ... good old fashioned bar with real beer in it. The Butler: (7 to 10 mins walk from the stn) ... Reading's best pub according to anthonyc_li. The Battle Inn: (Oxford Road) ... Reading's best Irish pub according to the Battle Inn. The Gateway: (Greyfriars Street) ... A genuine Irish pub and is very good at showing all Irish sport. There is usually a good LI crowd in there after games. Iguana (town centre): Long Island Ice Tea, anyone? Pavlov's: Not bad for a town centre pub. Purple Turtle: You ain't seen me, roight? Wishing Well: (near Reading West stn) ... a real Irish pub with Irish horse racing on the telly on Sundays. Rose & Thistle: (100m from Oxford Road) ... being taken over by Brummies. The Pondhouse: (Tilehurst end of Oxford Road) ... bowlingo and a bit of roughness at the weekends. LISC Marquee: Is usually located between the shop and the North Stand. Here on match days you can meet committee members, sign up for membership and purchase what has now become an excellent range of LISC merchandise. Adjacent to this is another marquee where players who are currently injured are available for a chat or to sign autographs. Eating: Hotel aside, the catering at the Madejski, whilst it has improved somewhat since its nadir a couple of seasons ago, can best be described as uninspiring. On match days, outside the ground, there are a few stalls which are run by the same company that owns the stadium catering franchise. Given the lack of competition the food comes at a premium price and shows little imagination. Inside the stadium things are, unsurprisingly, not any better. If desperate you might manage to find an over-priced, often stale, sandwich or a pie the contents of which are probably best not worth thinking about. The whole catering set up is outside the control of our club. It is managed by the Madejski cartel and lets down what is otherwise a very good stadium experience. Your trip to the Madstad should not be considered as a culinary one. One relatively recent innovation which has proved very popular is the a ‘Curry for a fiver’. This is sold from the Windsor Lounge, basically the upper bar in the hotel, when that is not being used for hospitality. Close to the stadium, heading into Reading, there is a retail park. This has a McDonalds, KFC and Pizza Hut. The Swan also does a limited menu of good pub grub prior to a game. There are of course numerous eateries covering pretty well every taste in Reading town center. Hotels: For those travelling some distance or who wish to take their drinking seriously the Millenium Madejski Hotel is an upmarket, 4 star, establishment within the stadium complex. LI have a deal here whereby on match days you can stay for £75 including breakfast. You can also sometimes also get deals here via lastminute.com or other internet booking sites, the lowest deal I have seen recently is £69 for a room excluding breakfast. The hotel has two restaurants, Cilantro and Le Café. The former is excellent if pricey. It fully deserves the three AA rosettes it holds. Le Café is nothing special, similar to many other hotel restaurants up and down the country. That said, it does the job. To get the LI room rate, call them on 0118 925 3500, ask for reservations then tell them you want the London Irish rate as you are making the booking. Alternatively go to the Millenium web site and enter the promotional code "lonirish' in the box that states Promo/Corporate ID as you make the booking. Also worth considering, particularly if the Millenium is sold out, is the nearby Holiday Inn Reading South. This is a ten minute walk from the stadium. Whilst it has no particular London Irish rate that I am aware of, the weekend rates for a double room can be as low as £51 excluding breakfast. There is also the recently completed Hilton, less than a mile north of the stadium on the way towards the town centre. Shop: The club shop is under the West stand. On match days about 80% of the retail space sells LI merchandise, the rest is given over to Reading FC. LI goods range from tasteful, if at times somewhat expensive, clothing to tasteless end of range stuff. Fortunately our club have put a lot of effort into merchandising recently and the more tacky/tasteless lines appear to be diminishing. This guide was first written in 2006, and we try to ensure it is updated at least yearly with the help of input from active supporters. Even then that at times is not enough. Whilst we strive to keep this guide accurate things change constantly. However hard we try here are bound to be inaccuracies or omissions. If you do find anything here that you feel needs changed, deleted or added please feel free to mail us - editors@londonirish.org - or post a message on the board. Team v Ealing next weekend. What do you think of this poll?